#6 – Commit to respecting and honoring God’s continuing work among the Jewish people and our leaders for the past 4000 years. In other words, surrendering a bias against tradition. In and around the Messianic Jewish world one will encounter a wide variety of attitudes toward Jewish tradition. But if one were to generalize, the terms that often come to mind are “distrust” and “indifference.” We need to realize that persisting in such distrust and indifference will in the end cause us to be estranged from our people. Some will protest that most Jewish people are themselves ambivalent about Jewish tradition. This is true. But we Messianic Jews, widely distrusted and deemed at best “outsiders” to the rest of the Jewish world, can ill afford to be perceived as critics of the way of life which Jews have recognized and honored as our own for thousands of years. This is a way of thinking and of living washed in tears, and often preserved in blood. In the 1990’s, together with a select group of friends, I founded a Messianic Jewish think tank called “Hashivenu.” Our mission statement was and remains, “Toward a Mature Messianic Judaism.” This mission statement gave rise to seven core principles. Although weaned and wooed to believe that our New Covenant faith was based on the Bible and nothing but the Bible, “the only rule of faith and practice,” we gradually discovered that living out our faith inevitably had a cultural component. The Bible cannot be understood apart from a community context, which helps one understand its deepest meanings. In this way, obedience might become incarnate in daily life. We realized that having our views shaped entirely by a non-Jewish context was leaving a foreign imprint on our hearts, minds and lives. We wondered if this was the best we could expect. Many of us had been brought up ignorant of, or even hostile to, the varied voices of Jewish tradition. Some had parents who paid lip-service to the G-d of our fathers, while in reality served the lesser G-ds of assimilation, success, and the unquestioned ideals of a good marriage, a home of their own in a good neighborhood, a comfortable retirement, and a better lifestyle for their children. Although these ideals were not unworthy in themselves, they become a form of idolatry when they get treated as the ultimate good. This form of idolatry can never, in the end, satisfy a people formed by HaShem to show forth His praise. But, we had been taught by omission not to look to Jewish tradition to learn how to live “the good life” in the modern world. Certainly, our evangelical contexts taught us to distrust the opinions of “the rabbis” whose views on life and faith were perceived as a deceptive and legalistic counterfeit of the more abundant life to be found in Yeshua. After all, we had the Holy Spirit! What could we possibly learn from the rabbis except dead religion? “The letter kills but the Spirit gives life.” Eventually, we recognized the superficiality of our judgments. We began to reckon with the fact that the proclaimed polarity between Torah and Spirit distorts the testimony of Scripture. We came to appreciate that New Covenant benefits include the Holy Spirit writing the Torah on our hearts, therefore causing us to walk in the statutes and ordinances of G-d. We began to appreciate the unity of Torah and Spirit. We also began to appreciate how our own spiritual lives stood to benefit from the fruit of thousands of years of Jewish struggle for understanding. Like Paul, we began to bear witness to the undying flame of Jewish zeal for G-d. We began to lean upon these structural pillars, which stabilize Jewish religious life, understanding that they could help strengthen us and the Messianic Jewish community as well. And what are these three pillars? The first is Torah, instruction for the good life based on the study of the sacred texts. This practice is helping us become more deliberate and informed in discerning the shape of obedience as we encounter life in all its complexity and particularity. Here, too, we learn afresh of the saving acts of G-d, of His promises, and see a reflection of His face. The second pillar is avodah, the practice of liturgical prayer, which continues to surprise and delight us in its power to enrich our lives. In daily davvening we take our place with our people in the promises and purposes of G-d, reminded again and again of His irrevocable promises to the Patriarchs. We sing His praises with them at the shore of the Red Sea, celebrating our deliverance, sobered by the righteous judgment that overtook our foes, of which not one was left. We hear again and again, as if for the first time, His promise to gather our people from the four corners of the earth, for not one letter of His word will go unfulfilled. Is He not the Blessed One, who says and performs, who decrees and fulfills? We rediscovered daily the faith-transforming power of the Passages of Praise, the time-honored wisdom of the prayer agenda mapped out in the Amidah, and the stability and challenge encountered as we join our people at the foot of Sinai, listening again to the living word of the one who never stops saying to us, “Shema Yisrael.” And we leave His presence reoriented and renewed, having again pledged allegiance to Him in the stirring words of the Alenu. The pillar of gemilut hasadim, deeds of lovingkindness, supports and informs us as we learn to understand the meaning of “true religion,” which one New Covenant writer defined as “visiting orphans and widows in their affliction and keeping oneself unspotted by the world.” His is a vision totally consonant with this third pillar. The splendid and rich tradition of Jewish ethical writings and discussion of the fine print behind “doing justly, loving mercy and walking humbly with your G-d” never ceases to chasten us, providing teaching, rebuke, correction, and training in righteousness, that we might be fully equipped for every good work. In all these ways and more, we have become informed and transformed by our own heritage. We rejoice at the privilege of drinking from our own wells, the wells from which our fathers, and from which Yeshua and the Apostles also drank and were sustained. Besides these wells we meet with Yeshua today, and here He speaks with us anew. Some, even many, will object about Jewish traditions. Generally, three objections are raised, all of which I consider ill-founded. The first objection is that “We don’t follow the traditions of men: we just believe the Word (the Bible).” However, this is not true, has never been true, and cannot be true. Every person reading this blog believes the Bible the way they have been conditioned to see it. This is easily proven. In the case of Christians, ask such people what they consider to be the text that best expresses their faith. Lutherans are apt to say, “The just shall live by faith,” or, “By grace you are saved, by faith, not of works. It is the gift of God.” A Mennonite is apt to say, “Blessed are the peacemakers, for they shall be called children of God.” A Roman Catholic is apt to say, “Thou art Peter, and on this rock I will build my church.” A Baptist is apt to say, “For God so loved the world that he gave his only begotten Son . . .” A Pentecostal is apt to say the key text is, “You shall receive power after the Holy Spirit has come upon you, and you shall be witnesses unto me in Jerusalem, Judea, Samaria, and the uttermost parts of the earth.” Each category of believer comes to see the Bible in a manner conditioned by his/her community. And all of us are conditioned by community consensus and by our teachers and books read, teachings heard, to consider certain parts of the Bible as more important than others, and as overruling others. My point is, none of us approaches the Bible apart from a tradition, a communal habit of perception and expectation of action. The second objection is one that discounts all traditions as bad or at least suspect because they are the tradition of men. Of course they are the traditions of men: these are not the traditions of chipmunks! But there are three categories of traditions of men, and of these, only one is to be excluded. There are traditions which support or implement what the Bible is meant to teach, these are good and should be kept. There are traditions which are neutral, like closing your eyes when you pray (which most people have learned to do as a tradition . . . the Bible nowhere teaches this, nor does it forbid it!). These are also good and may be kept. Then there are traditions which violate or contradict what the Bible is meant to teach: these, and only these should be rejected. So if anyone throws out to you this slogan, “We don’t believe in the traditions of men,” there are two answers. First, EVERYONE observes some kind of tradition. A tradition is a communal habit of behavior or perception. And the second answer is that only one kind of tradition should be rejected, that which makes void what the Bible means for us to do. 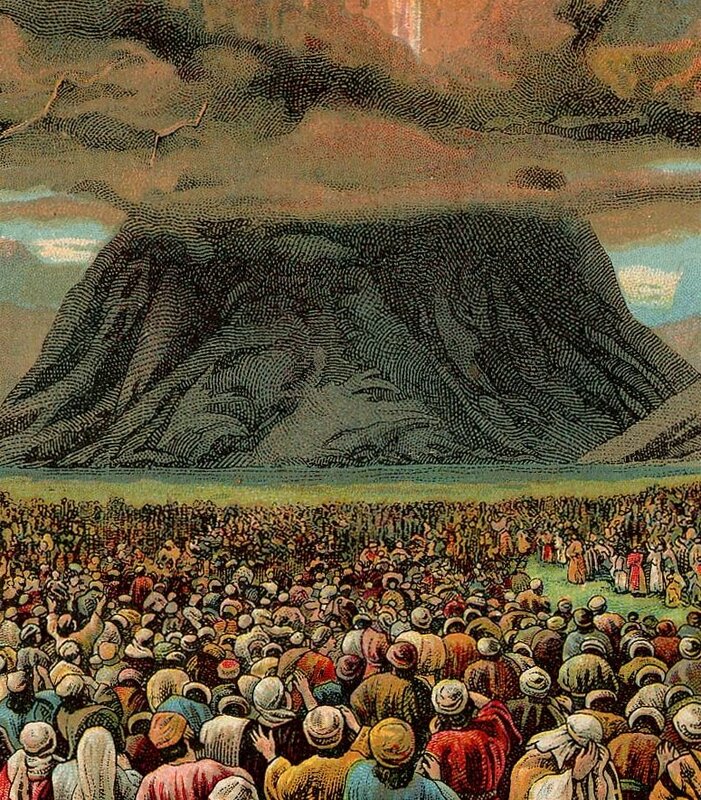 The Torah-teachers and the P’rushim . . . sit in the seat of Moshe. So whatever they tell you, take care to do it. But don’t do what they do, because they talk but don’t act! Yeshua is telling us, his disciples, that the Torah-teachers and the P’rushim, the lineal antecedents of the rabbinic establishment, have the authority to tell us how Jews ought to behave. In general, we are to heed their teaching, but not imitate their bad example where they fail to live up to the best of their holy tradition. Woe to you hypocritical Torah-teachers and P’rushim! You pay your tithes of mint, dill and cumin; but you have neglected the weightier matters of the Torah — justice, mercy, trust. These are the things you should have attended to — without neglecting the others! Here Yeshua is criticizing the Torah-teachers (Scribes) and the P’rushim (Pharisees) for neglecting the majors while following their own traditions (tithing mint, dill, and cumin, which is a rabbinic tradition). But don’t miss this: he goes on to say that “These are the things you should have attended to (the majors, justice, mercy, trust) without neglecting the others (the tithing of mint, dill, and cumin, and other such practices–their own traditions). He is clearly saying this which we all need to hear: traditions are not wrong. What is wrong is neglecting the majors while being preoccupied with the minors. All of us have traditions. It is not possible it could be otherwise. A tradition is a communal habit of thought and practice, and a humans, we are habit-forming creatures. Tomorrow morning you will put the same sock on first as you did the day before and the days before that–it’s your habit. We all have traditions, but most of us are unaware that we have them. Many of us, under the sway of centuries of Christian tradition, have a tradition of our own: a certain contempt for Jewish tradition.This is a tradition of men which we all ought to reject because it contradicts the explicit teaching of Yeshua and the example of his apostles who lived tradition-honoring lives. Isn’t it time for Messianic Jews to get over our tradition of rejecting Jewish tradition? Hear, Hear! I particularly liked reading your invocation of three pillars, and I noted that they are in fact three of the seven pillars hinted at in Prov.9:1 – “Wisdom has built her house; she has set in place her seven pillars”. An alternative translation of this term “pillar” is “foundation stone”, where the architectural image is one of a column sunken into the ground to provide a firm footing for the foundation. Structural considerations notwithstanding, the seven pillars are: Shmirat Shabbat, Shmirat Kashrut, Taharat ha-mishpachah, Talmud Torah, Avodat HaShem, G’milut ‘Hasadim, and Tikun ha’Olam. You’ll note that your three are kind-of in the middle, there; and early in the daily shaharit preliminary morning blessings we find a list of actions whose fruits we eat in this world while their fullest reward awaits us in the world to come, and the summary concluding line is: “v’Talmud Torah k’neged kulam” (and the study of Torah is alongside all of them). Another excellent and well informed comment. Thank you for that. I may use your seven notated pillars as an outline for a book! Will that be OK with you? Surely you may use them. Years ago I wrote a small volume, never published, on the theme. Perhaps you’ll have better luck with them. I got bogged down trying to flesh-out G’milut Hasadim, because, at the time, I found myself insufficiently experienced with it.